Lynn of Fresh April Flours is hosting a virtual baby shower for Leah over at Grain Changer, and I couldn’t be more excited to help celebrate. To backtrack a little bit, I “met” both Leah and Lynn when I first started my blog back in the summer of 2015. When I realized we were all living not too far from one another on the Eastern side of Pennsylvania, it was an instant connection. Sadly enough we never quite got the opportunity to meet in person while I was still there. However it’s still fun keeping up with them on their blogs. It truly is amazing the connections you can make over the interwebz. Sometimes I find myself getting caught up in the downside of social media, i.e. feeling like you have to be “plugged in” all the time. 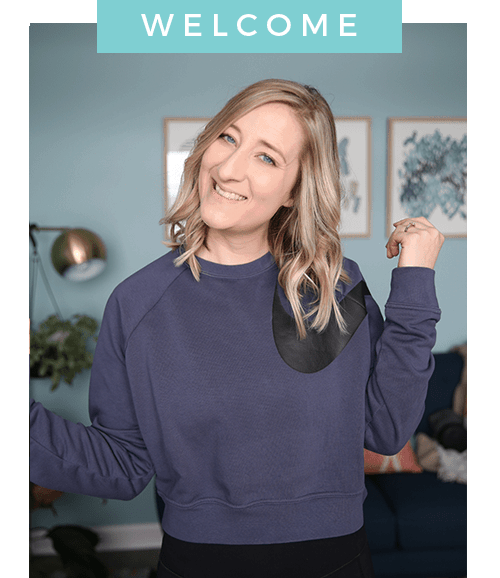 I know I get annoyed a little bit with how often we rely on social media and technology to stay connected with each other (yes, I said it, coming from a blogger). But on the other side of that you have this opportunity to connect with people all over the world that wouldn’t really be possible without technology, staying in touch via different social channels. So in honor of Leah’s first little babe arriving, we are showering her with all of the granola! Because, granola is Leah’s favorite. 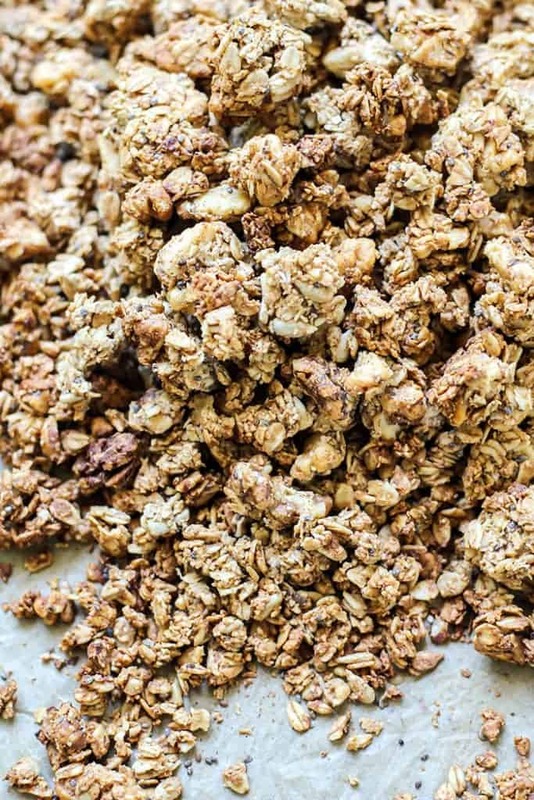 So have you made your own granola at home yet? It really is quite simple and it makes your house smell amazinnnggg. Oh, and if you’re a cluster fanatic (who isn’t?) the key to getting those clustery chunks is to avoid stirring the granola on the pan, but instead *flipping* the granola with a large spatula in between the baking times. Also, I like to mix the ingredients together at the end with my hands to really blend it all in. 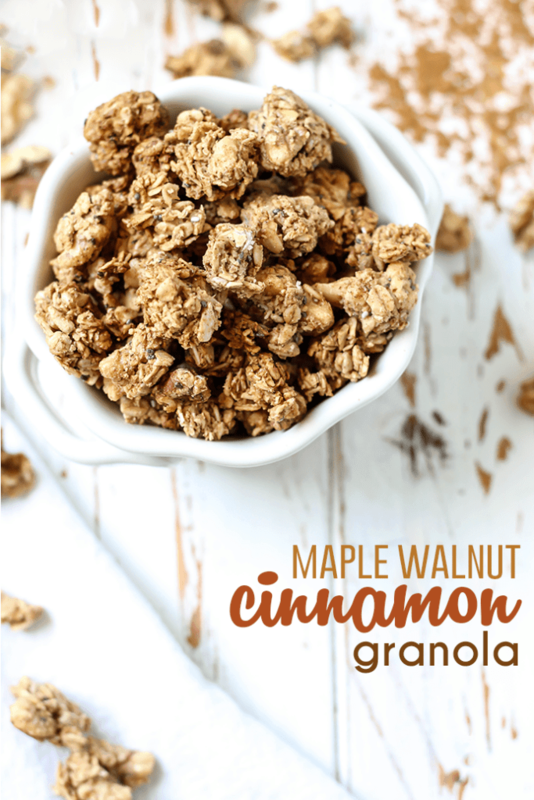 But really this cinnamon granola goes great with everything. It’s a simple, classic flavor that pairs well with yogurt (my personal favorite), on top of smoothie bowls, with oatmeal (double oats, yes) or straight up by the handful. Preheat oven to 325F degrees and line large baking sheet with parchment paper or silicone mat. In a large bowl add rolled oats, quick oats, walnuts, sunflower seeds, and ground cinnamon. Stir until combined and set aside. In a small bowl, stir together almond butter, maple syrup, coconut oil, and vanilla extract. (If almond butter is very thick, microwave with maple syrup and coconut oil for about 15-20 seconds.) Add almond butter mixture and chia seed gel to large bowl of dry ingredients, stir with large spoon until the dry mixture is well coated. Then, use your hands to fully mix and get the clusters ready. Remove granola from oven and allow to cool completely, do NOT stir again. While the granola cools, the air will help set the crunchy texture. –Granola will make roughly 6-8 servings, about ½ cup each. *You can also use one large egg white as binder, or same ratio for milled flaxseed + water if you don’t have chia seeds. 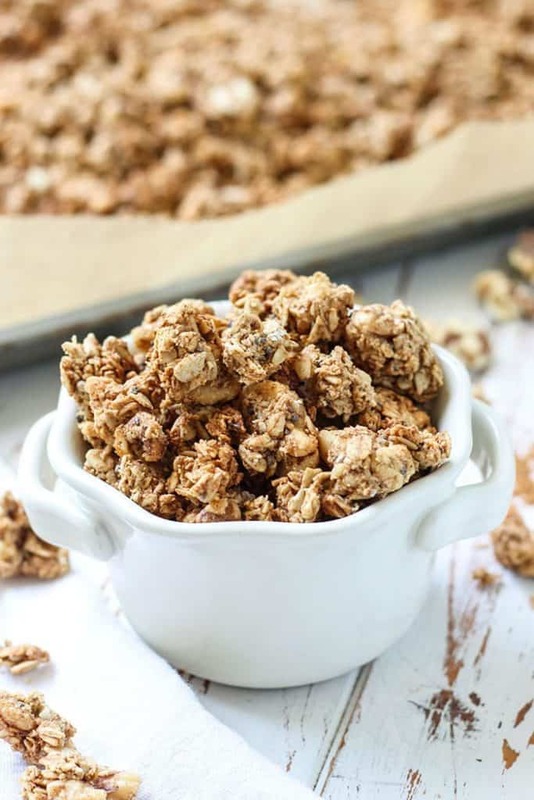 **Using a mixture of old fashioned oats and quick oats helps create the clusters. But feel free to use all old-fashioned if you prefer. ***Not stirring the granola as much will get you more clusters. I use a big spatula to “flip” the granola, rather than stirring. I also “sprinkled” the mixture on the pan, which resulted in more clumps from the beginning, then only flipped the granola gently to maintain the clusters. Watch granola after each time flipping to make sure it is not getting too dark, adjust time accordingly, as every oven is different! 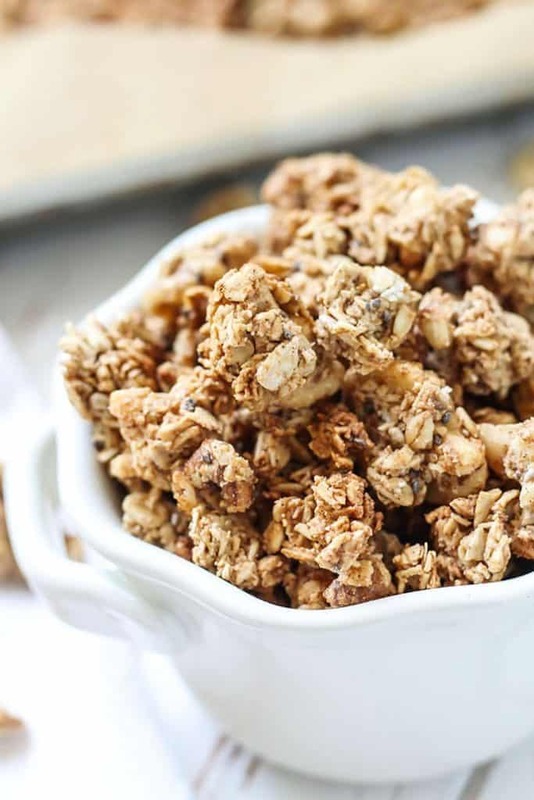 Don’t forget to check the rest of the party and all of the amazing granola recipes! Waiittt get out, you’re in PA??! I’m in Schuylkill County, but I’m from Montgomery County! EEEEEkkk, yay! Also, I love a good granola! Going camping this weekend so this may have to go on the (growing) food list. Oh but have fun on your camping trip! We went on the house boats on Raystown a couple summers in a row and had the BEST time. One of my favorite memories there! Where will you be camping!? Oh my gosh!! I just want to pick those clusters right off the screen 😉 This granola looks so delightful. If I made a batch, I’d be stealing handfuls all day!! On another note – you are so right – the Internet and social media have many positives, as well as negatives. Today I’m all for it because I get to see this lovely granola and celebrate Leah with you 🙂 So happy to be a part of this granola party! It’s so hard not to grab handfuls here and there! Especially when shooting. lol SURPRISE 😀 I agree though, never too much granola. 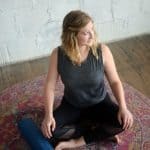 Granola with chia seeds? I’m DOWN. What a fun idea!! And this looks delish. I just loveeee the flavor of maple, so warm and comforting! Maple anything definitely. Thanks Christina! you had me at maple and cinnamon. Lol we definitely didn’t. Granola is just too addicting! THANK YOU sooooooo much for joining in on the celebration of our baby boy!!!! I LOVE how the interwebz connects us all – so amazing! Hopefully one day soon you’ll be back in the area and you, Lynn and I can all get together 🙂 This granola looks absolutely INCREDIBLE too. Just what I’ll need to power me through those sleepless nights that I hear are coming my way 😉 CAN’T WAIT to try this out. xoxo. From what Lynn tells me those nights are a real treat 😉 <3 You'll do great though! You'll have to get your hubby to help make batches of all this granola to have on hand as a midnight snack. I can’t wait to try this delicious granola recipe. 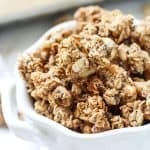 I am WAY into clumps, and I love that this has almond butter in it too! Delicious! Congrats to Leah! And this recipe looks amazing. Bookmarked. This is such a cute idea! And that granola sounds amazing! Ever since I started making my granola, store bought just doesn’t taste the same anymore. Never thought to add almond butter, but definitely giving it a try soon! Allll the right flavors together in gorgeous clusters! Love everything about this recipe! It smells wonderful!!! and I know it will taste even better!!! Well thanks so much Kathy! And thank you for taking the time to comment, that means a lot 🙂 Hope you enjoy! I’m planning on making this but the amount of sunflower seeds is still not mentioned?